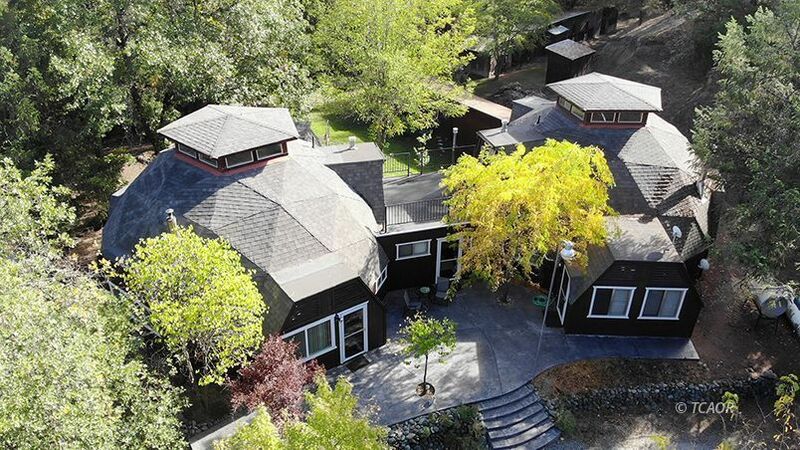 This property features two great Geodesic Dome houses on 3.09 gated acres. Both homes are nearly identical with slight variations in tile and carpet style. Both have an open living area with a wood burning stove in one unit and monitor heaters in both units, kitchen, living rooms, and dining areas, main bath with separate vanity room downstairs. A spiral staircase leads you to the master bedroom loft with another half bath in both units. Homes share a breezeway with laundry room and also have a shared upper patio from the second floor bedrooms. Main home has a bonus sun room that leads to the back patio and yard. Property features a nice sized garden shed with power, a critter pen for all the animals you may want, a fenced in garden area with an automatic drip system, a 2 car garage with a wood stove to keep you warm, a 4 car carport to store all of your outdoor toys and even a 2 man hot tub to help you relax under the mountain stars. This would be great for income, living in one and rent the other, or use as a duplex for extra income. So close to Trinity Lake and Trinity River, or all your backing packing and hiking desires. Don't let this one slip away!